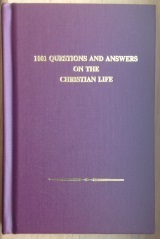 1001 Questions & Answers On The Christian Life is an important little text which concisely lays out Christian beliefs as understood by the Amish. 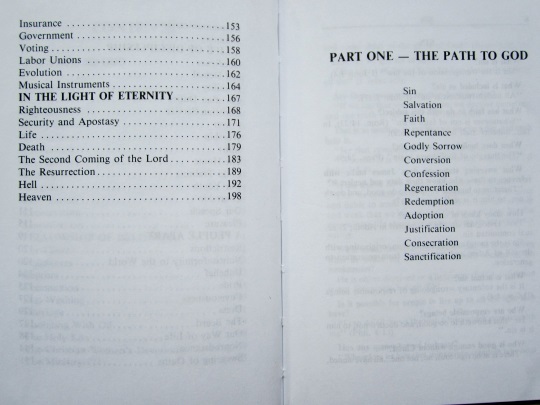 The book, first published by Pathway Publishers in 1992, was created with the input of over 20 members of the Amish ministry and lay people in various communities. 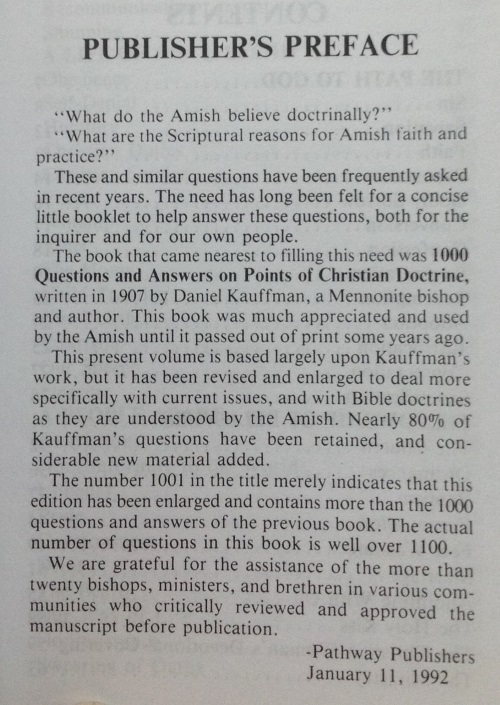 It is based upon an older text (written in 1907) called 1000 Questions and Answers on Points of Christian Doctrine, by Mennonite bishop Daniel Kauffman. As the publishers explain in their preface, 1001 Questions & Answers is based on that out-of-print work, with around 80% of the original questions kept. I’ve pulled some questions from selected sections which are particularly relevant to the Amish. Some of these may be questions you’ve had before. You might also find that not every Amish person or church you know or have observed follows these guidelines to a tee. As mentioned, the book is produced by Pathway Publishers, and while it is meant to be universal, it may still reflect the biases of that organization and its parent community (for instance, not all Amish may adhere to or endorse counsel given in the sections on courtship, or on voting, to take a couple of examples). What rule does Paul lay down on the dress question? (1) Dress in “modest apparel” (I Tim. 2:9). (2) Avoid vain display in ornamentation, such as the wearing of jewelry, fussing up the hair, and costly clothing (I Tim. 2:9). (3) Dress in a way which becometh people professing godliness. (4) Avoid conforming to the world (Rom. 12:2; Eph. 2:2). But a specific form of attire, such as that worn by the Plain People, is not spelled out in the Scriptures, is it? No, but the principles are. The church has adopted suitable dress standards for our climate and culture, based on these Biblical principles. What of the variation in dress standards from one community to another? That is to be expected. Each group of believers decides how to best apply the principles. The details may vary, but the underlying principles are the same. Should not the clothing be so simple and of such a character that it attracts the least possible attention? Then would it not be better to fall in with the customs of the world, so as not to attract any attention? There is a difference between sensational display and simply letting your light shine. The inference contained in the question would force Christian people to surrender every doctrine of the Bible. Who ordained that there should be a secular government? What is the role God has planned for the government? To protect the good, and punish the evil (Rom. 13:2-4). Does that mean God is pleased with all governments today? No, God is pleased only to the extent that they are faithful in doing what they are ordained to do. There are many corrupt governments today; some are doing the opposite of what they are ordained for, punishing the good, and rewarding the evil. Do we have the right to resist a corrupt government? No. God will judge them. What is our duty to the government? It is threefold: (1) Pray for them (I Tim. 2:2). (2) Obey them (Rom. 13:1). (3) Pay taxes (Rom. 13:6-7). But what if the government asks us to do something that the Bible forbids? In that case our first loyalty must always be to God (Acts 4:19). What should be our reaction when we hear people complaining against the government? We are to be respectful to the government at all times. We must never join in when men speak evil of it. We should either remain silent, or where appropriate, reprove such complaining. We have much to be thankful for to live in a land of religious freedom. Instead of complaining, we should express our gratitude, live in quiet obedience, and pray for our rulers. Should we join in campaigns to get the government to change its laws? There is a great danger here. We should be the first to desire that the church and the government be separate. If we don’t want the government to tell us how to conduct our church affairs, we had better not tell them how to run the government. Is there a need for musical instruments in the Christian church? Did they not use instruments to worship God in the Old Testament? Did God command instruments to be used in worship? No. God gave the law through Moses, gave him full instruction in all the details of worship, but nowhere did he command the use of instruments of music. Likewise, when the New Testament was given, not one word is found to support the use of musical instruments. Has not the question of shunning caused a lot of trouble in a lot of churches? Shunning is a practice commanded and sanctioned by God for the protection of the church. The obeying of God’s commandments brings a blessing to all involved, not trouble. But what has caused trouble has been people who were no longer satisfied to accept what God has ordained. Is it not true that shunning is done at times in a spirit of revenge and out of spite towards the person shunned? That may be true in some cases, and is to be deeply regretted. When the need arises to discipline an erring member, the entire church should pray earnestly that they might act out of love and concern, and never out of ill will or spite. What did Paul say about this matter? “If any man obey not our word by this epistle, note that man, and have no company with him, that he may be ashamed. Yet count him not as an enemy, but admonish him as a brother” (II Thess. 3: 14-15). Contributor ShipshewanaIndiana has kindly offered to give away a copy of the book to an Amish America reader. Simply leave a comment or question on this post, and we’ll draw a winner at random. These answers are not just for the Amish. Every Christian should read this book. It is a brilliant refutation of the evil that has filled so many American churches. Thanks, and please consider posting more. Thanks for asking Alex. I will try to post some more of this when I post the winner. i would love to be able to read this book, I am just new to Christianity, since July 2014, I have much to learn. Blessings to you! If your Christian walk goes as mine does, you’ll find one never really does stop learning and the older I get the more I realize how little I know, but keep on keeping on… This book is very important to me and I am glad to see it mentioned here. I can’t add anything to what Mark replied to you, except to say that his experience mirrors mine. Many Blessings to you, Kim. thank you @oldkat and @Mark for your support and encouragement. I appreciate it a lot. I didn’t know that such a book existed. The excerpts published here are excellent. If I don’t win this book (which I probably won’t! ), I’ll be in the market to buy a copy. I have been looking for this but could not remember the title. Eric can you post the contact info of where this book can be purchased. It’s about halfway down the page. I’ve also got it included and linked in the “Best Amish Books” page in the top menu of this site. I would like to add that the above book is not exhaustive in scope of Amish doctrines, beliefs, and practices. Actually no book is nor can be, as for most Amish, the daily life rules, called Ordnung in German, are not written down. If one is to order the book from the above store in Erik’s link, you could add the book titled “In Meiner Jugend”, which is located in the German books section of the store. The book is in German AND English, so don’t worry about the languages. It contains the confession of faith that all Amish and some others use, some prayers, hymns, the vows at baptism and marriage in various groups, plus the Apostles Creed and a set of suggestions for behavior called Rules for a Godly life. This book also costs only $1.50, so it is quite inexpensive and adds to ones understanding of Christian faith and practice as the Amish see it, and contains much that is not in the 1001 Q&A book. Another book for the interested would be “A Devoted Christian’s Prayer Book” for $4.50, right near the 1001 Q&A book on the web page in Erik’s link. The first morning and evening prayers in that book are the translations of the prayers many Amish use each day, they are not short. There are many other prayers for various uses and topics. Those three books, and of course the Bible too, are a very good start in understanding Amish theology. Lance, Thank you for the additional book recommendations. I just put my order in. This book sounds fascinating. I’ve always had questions pertaining to certain things about the Amish beliefs and this book looks like a great read to answer some of those questions. I would so love to add this book to my library! We had a Christian missionary from Russia speak in our church and what atheism had done to the country. Their lives in most aspects were failures such as relationships, marriage, parenting, work life, just to name a few. She held up the Bible and said, “This is the rule book of life!” The focus of the country was on new Christians because they were the future! For the Amish the Bible is their rule book. Granted there are those that pick and choose passages that they adhere to such as “spare the rod” but there have always been those people around since the beginning of time. As America has “drifted away” from the Bible,church and it’s teachings, there is evidence of life’s failures just as the Russian missionary said to our congregation! New Christians are the future! We need a revival in this country and it best be soon! I’m afraid it would be considered old-fashioned and inconvenient by most mainstream churches today. But God’s truth never goes out of style, at least for those who follow Him. Is it common practice for Amish to cut trees on property that is not theirs for their benefit? If so, How is that Godly? That’s like asking if it’s common practice for Methodists to use their leaf-blower to blow their leaves on their Amish neighbor’s yard. It happens, but I would never assume it’s Methodist practice. Godly or not, we recognize it is that one particular person’s failure — not Methodists in general. I’ve never heard of anyone cutting trees that were not their own or an agreement made, but that doesn’t mean it could not happen. Just saying that TWICE now Amish have done Timber theft in our area in the past 10 years. Have not heard of anyone else doing it and I find that UNGODLY. Thou shalt not covet thy neighbors property!! Did anyone talk to them? Or bring it up with leaders in the community? Or report it? I deal with Amish all the time in the lumber industry and never heard of that, but it would be interesting to know what actions were taken. I doubt anyone would disagree with you that theft is wrong for everyone. But I think the idea was let’s not class everyone by the actions of a few individuals. They have been spoken to…but the law says..1) it is a felony and 2) It is over $100,000 in damages. Can someone even collect that much from an Amish person? I know they would not like Jail time and that does not really settle the matter for our neighbor!! It was intentional…after having been told the could only trim trees overhanging a path they wanted to use (They didn’t own the path either)..but they CUT them to about a foot above the ground. A horrendous situation this time of the year as any time of the year. But then there have been several lawless things happening so I just don’t know what to tell my elderly neighbors! I feel for you and your neighbors… and I’m ashamed anyone professing to be a Christian would disobey or disregard an agreement or deliberately do wrong. But anyone, Amish or English, who does wrong needs to be responsible. If the people who did it are unwilling to make it right, you might discuss the matter with their ministers. Also, Lois Lane: Like Mark said those sort of things happen. Frankly if something like that happened to me I’d approach the tree cutter in a non-confrontational way and ask why that was done. I can almost assure you that this will cause the person to think about what happened & apologize. Probably they never gave the subject a thought before they did it, which is generally the cause of most misunderstandings anyway. BTW: Thank you so much for providing this giveaway ShipshewanaIndiana. Oh and Erik, I’d LOVE to win this book! Oh. Please. But this might help me understand why my Catholic neighbor comes into our woods to pick autumn bittersweet vines. I thought she was just clueless and thoughtless, but perhaps it’s common Catholic practice? Nah… I’m adult enough to realize her actions just indicate she’s a clueless & thoughtless person and her actions don’t apply to the millions of other Catholics in the world. OldKat: your response inspires me to say something to her in a mature way. It’s not that it’s a big deal, it just seems a bit un-neighborly. Good advice! All of probably deal with things like this at some time or another. So while I feel for you, Lois, don’t assume any one person’a actions speak for their whole culture, religion, gender, or race. I assume that your “woods” is a rather small parcel and you haven’t many of the “vines” in question, otherwise you wouldn’t be so concerned that your neighbor picks them. However, if you own a good amount of wooded property, what’s the harm of allowing your neighbor to pick all the vines she wants or needs. If I didn’t need all the vines for my own use, the amount gathered I would consider of no consequence and actually go out and help her/him pick. In the case of a small crop of vines that I wished to utilize myself, I’d confront her/him the next time I observed her/him picking the vines and tell her/him that I use the vines in my business, hobby, whatever but I’d be willing to sell some – not all of them at a nominal fee. We have almost 2 acres of “woods” but just a small patch of bittersweet. It’s not really such a big deal, it was just something that occurred to me in reading other comments. I did eventually telling the neighbor that we planted those vines to use as autumn decor and I don’t mind sharing, but I’d kind of like to have some left for myself. Then I felt bad — she was so embarrassed — she thought they were just pretty wild vines. We ironed it all out and now she gets some of the vines and I get some of the beautiful gourds she raises and we are both happy. The point I was trying to make was we shouldn’t judge a segment of the population by the actions of one or even a few representatives from that segment. I would love a copy of this book to read, too. If someone doesn’t win the contest, is there a place the book can be purchased? I would love a copy of this book! I have been looking for something along this manner for some time which explains in detail concerning the Amish way of life. Thank you for bringing it to our attention. I am very interested in this book. 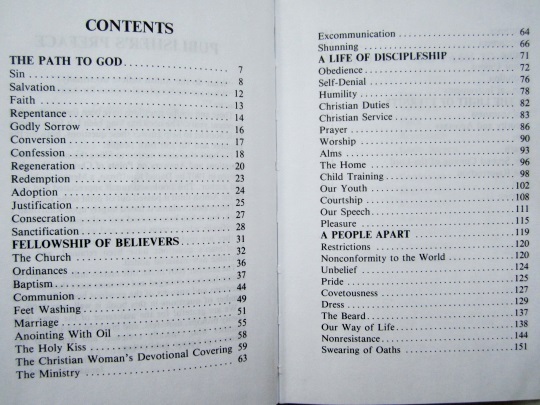 I would love to have a reference book like this…seems easy to read and look up various beliefs. To every reader of this great blog, I wish a very nice and peaceful Christmas ! shine among you all the new year long ! I was lucky enough several years ago to pick up this book at an Amish quilt shop my wife and I were visiting several years ago. It is thoughtful and interesting reading. I keep it on my bedside table to refer to. As a Catholic there are a few things we dont agree on, but it is a wonderful book to help on our Christian walk. Thank you for sharing this book and the link to buy it. I think any Christian should practice the basic principles laid out in this little book. I agree with Dennis Regling, the main stream church has become more like the world and less like the first church in acts. The Amish and Mennonites have held more to what is Godly than our mainline church today. I do not think we have to wear clothes identical to the Amish, but surely we can dress modest and spend less on the latest style. Eric, if you draw my name please draw another because I am ordering the book today. I noticed that, within this article, the phrase, “the Amish ministry” was used, as well as seeing that, within the “Contents” page, the heading, “The Ministry” (p. 63) was also listed. I’m hoping that, with the acquisition of this book, I might find some explanation/discussion as to the Amish view of such scriptures. Sorry for the bad news but don’t expect much discussion about the subject of evangelization. It doesn’t take center stage the way it does for American Evangelicals, and when they ‘reach out’ it takes forms that most AEs wouldn’t recognize as evangelism. This is a broad subject in its own right and cannot be dealt with adequately unless we clearly define the nature of the church, its boundaries, it’s discipline, the Lordship of Christ, the relationship between justification and sanctification, the nature and forms of the world, etc. Many Amish have little vision of reaching those around them. But many do. Nevertheless, since they offer different answers to the preceding questions than one would find among Evangelicals you also find quite different ways of putting this type of ministry into action. So I suspect you will not find what you are hoping to find. But if you engage the wider questions you might understand more fully why Amish life takes the forms it does. But these are only my thoughts, for whatever they might be worth. Blessings to you. When, within the book, “1001 Questions & Answers On The Christian Life,” there is a section heading entitled, “The Ministry” (p. 63), I am quite curious as to how this topic is, indeed, applied and/or addressed – hence, my interest in acquiring a copy. I’m glad for your interest. I was not intending to imply that you should not acquire this text. Only that it might seem inexplicable or perhaps incoherent without attending to the wider web of beliefs that direct the way they seek to put these texts into practice. I am mainly speaking from personal experience so perhaps it won’t apply in your case. It just looked as though it might because of the language and presuppositions that were present in your original post. And I cannot remember the last time I heard the words evangelization or Great Commission used in a sermon, or even among the men after church. Alan, I have always wondered the same thing about the Amish NOT spreading the Gospel as it states in Matthew. A friend asked a good question: Why do you always see English at Amish fund raisers, but not many Amish at an English one? So, I asked an Amish friend who is from a conservative community in Hillsboro, WI, and he commented that the church there frowned on fund raisers period. They don’t have any or attend others outside the community. Our newest Amish friends are a new order of sorts as they have electricity! To sit in an Amish kitchen and see a gas cook top, electric wall oven and refrigerator, and then the phone rang about did me in! And they milk their cows with a pipe line milking system! They dress traditional and drive a horse and buggy. They do spread the Gospel sort of as they have a hymn sing at the local nursing homes once a month. That was also a new one for me. You see Mennonites sing in different places but hardly ever Amish. We have Amish friends in several different communities and the “rules” vary as far as what you can and can’t have. I think the beliefs are often occasional in nature. Because Amish beliefs and practices are not directed from a central source they are especially subject to historical and sociological factors. And because they are not particularly conscious of the context they are functioning in, do not expect too thorough an explanation. They will often explain the ‘why’ they do such and such but rarely understand the many factors that have influenced their decision or who or what they might have been responding to over the past hundred years. Let alone how the beliefs and practices stand in relation to the Nicene Creed, for example. But don’t be too disappointed. That’s just life. I’m Amish and in this area, there are many non-Amish fund-raisers that our community helps with & attends, such as the yearly Red Cross fundraisers, Aid to Haiti, Hospice, the County Home Benefit, etc. So again, standards can vary a lot from area to area. Our youth were involved in a prison outreach and last week took cards & cookies to prison to pass out and sing for the inmates and another evening several neighborhood families too donations, Christmas “goodies” etc. to the homeless shelter and gave a Christmas program. So again, we see diversity and different interpretations and convictions. I appreciate the fact my line of work puts me in contact with literally hundreds of visitors to our area and I am grateful to be able to share my faith and explain it. I love your comments, and the way you word things. I often look for your thoughts at the end of an article. I just wanted to say thanks for sharing. You are welcome, Galen. And thank you for the encouragement. Sometimes I worry I write too much. Great post today. Looking forward to seeing even more comments later. Wow. The observation on separation of Church and State made me do a double-take. So much wisdom there. I shall carry that with me today, and ponder…. This is a book that everyone should read! I totally agree with it’s content and wish all society would conform to these rules. Wouldn’t it be a lovelier world to live in IF everyone loved each other? I enjoyed reading the excerpts that you posted. The writing is remarkably clear and simple; even elegant. Given that this book was written by more than one author (a committee?) that is surprising. I hope to read the whole thing soon. As someone who can be wordy, I appreciated the concise language too. What you’ve posted makes me want to read more. I would like to read this book very much. Daniel Kauffman was my grandfather’s cousin. ” Should not the clothing be so simple and of such a character that it attracts the least possible attention? That was what I thought about that, and what was what stood out for me in this fascinating article. I wish everyone a very Merry Christmas and I hope everyone is well! Have to agree…They stand out even though they don’t want to. Modest attire would make more sense..and you have to wonder how HOT it gets in those clothes on a Hot summer day!! Yes, I guess we do stand out even if that is not our goal, BUT attend any Amish gathering — church, wedding, funeral, auction, visiting, work-bee, or whatever — and we all look alike (more or less), so standing out in terms of the world becomes separate from being dressed alike as members of a brotherhood. And warm? I dress plain year round and never had any reason to feel I was too warm, though I do wear looser, lighter weight clothes in warm weather. I guess to me modesty & simplicity is reason enough to dress as I do and even on the warmest days, I’d feel more uncomfortable to be dressed immodestly. But to be fair, our church is more “modern” in dress than some and I can believe those who dress in heavier clothes might have more reason to feel warm. I thought it answered the question well. As Mark said, the Amish don’t stand out to themselves, but to someone like me, they most certainly do, in fact if I where visiting right now I’d stand out because I am not modest to the Amish standard or plain. I appreciate that you added this, Erik, I’ve enjoyed reading about Amish plain dress over the years and having my and everyone’s questions about it answered, I hope to learn more about the topic and I am looking forward to more insights and points of view. Would love to have my own copy to read. Looks like this would be a helpful and informative book to have. I have an original copy of the original book, this one, and a smaller phamplet sized one. I love it for the straight forward Q & A format. The Original work is more in the line of a in-depth comentary on cwetain subjects, and it still stands strong today. Thanks for bringing this to our attention. I really love when we are exposed to these types of books. Great reading. I enjoyed the part you posted n blessed to read the rest! please enter me in the opportunity to get the book, thank you. I enjoyed reading this post. I bought a copy in November, so don’t wish to be in the drawing. I bought two copies at a small bookstore in Middlebury, Indiana. That bookstore had several Pathway publisher books as well as many other books about Amish life. I think the name of the bookstore is New Life Books and Music. I’d be interested in reading a post on Amish America sometime about a listing of bookstores in various locations that sell Amish books. Maybe that could be a category in the Amish Business Directory of AA. I should have added a comment about why I bought two copies of the book. I have a friend who is very interested in understanding more about Amish life and gave a copy to him. He browsed through it and said reading it will help him understand the theology behind some parts of Amish life. Would enjoy reading this book! I live in northeastern Pa and often go to the Lancaster area of Pa. The off season for tourism is best. I love the contact with the Amish and would love to have this book to see how they interpret the Scriptures. I am a born again Christian and have gone to Bible College but the Amish beliefs were one thing we didn’t touch on. Thank you for the newsletter. Makes me feel like I’m in Lancaster! Glad you enjoyed it Cheryl. If you’d still like to pick up the book the link shared above should be a good place to find it. Another book you might consider is called The Amish Way: Patient Faith in a Perilous World, which is a very accessible look at Amish Christian faith and beliefs in practice. I have always been interested in Amish life. I have Amish/Mennonite ancestors several generations back but I know nothing about them. My best friend in grade school was Mennonite and I loved to spend time with her family. As our world and our country seem to be on a rapid decline I am even more interested in the simple ways of Amish living. This site is a gem! I’ve been saying this for a while now. Thank you for so many interesting posts and useful information, Erik! Readers’ comments are also very valuable and I appreciate everyone’s input! There are so many things to learn about one from another. I just love being here and read whenever I can, no matter how old is a story or another :). Greetings from a Lancaster, Pa.& Amish ‘fan’!